I am a self-taught artist who as an adult went back to school to redefine what it was I wanted to accomplish with my art. I attended many classes at the University of Vermont in a two year period which helped me to grow immensely as an artist. After experimenting with my art for a while, a life altering event caused a complete shift in how I painted. Prior to this shift, I painted about what I saw and knew which included still life and landscapes. It then became more about what I felt and about pushing the boundaries of how I had previously painted. This release allowed me to paint with freedom and emotion which for me led to a very different means of expression, a very abstract expression. 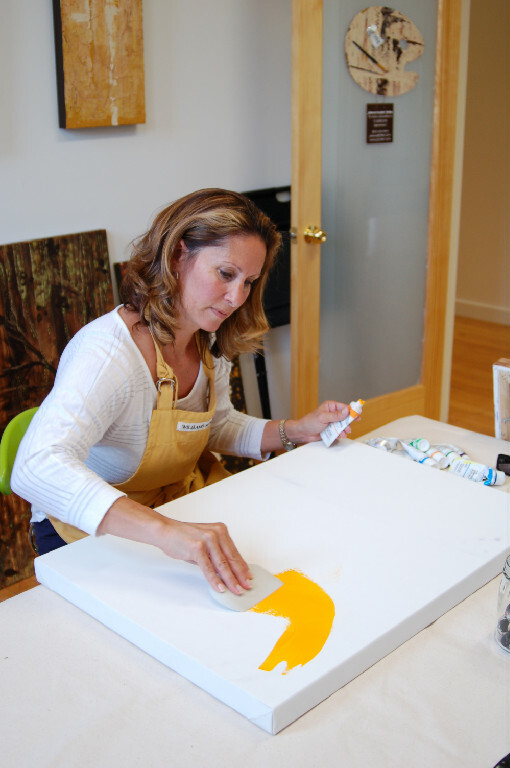 As I continue on in my journey of abstract painting, I find more fascination and freedom to explore and experiment. Some paintings are deliberate and are meant to evoke specific emotions while others are an exploration of technique, color, and texture. I continue to pursue every avenue so that I may share what I love to do with others. Art imitates life and is a continual process of growth and curiosity. It will live long after we have gone.